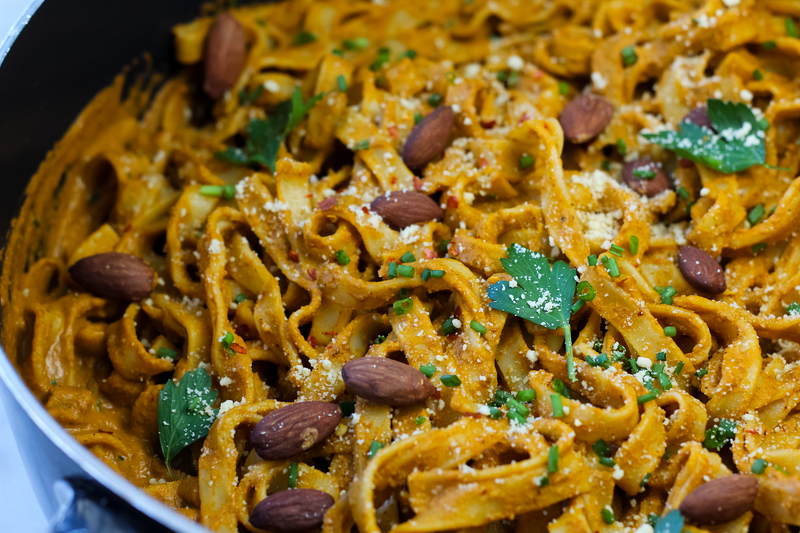 Luscious, creamy, and rich Vegan Roasted Red Pepper Alfredo made with roasted almonds, fresh basil, and roasted red peppers. This Vegan Roasted Red Pepper Alfredo is easy-to-make, ready in only 30 minutes flat, and is full of flavour! How have you been!? Is it finally starting to feel like Summer where you are?! Jeroen and I recently moved into our new condo and we are finally all moved in. I definitely underestimated how much work our move proved to me, even though we moved into the condo next door (ha!). Well, everything is now unpacked and our new place already feels like home. Our doggo Henry is all settled in as well. We moved into a super dog-friendly building and they even have treats when you walk in the main foyer. My mom watched Henry while we moved and it only took him about a day to figure out why all “his stuff’ was in a new place. 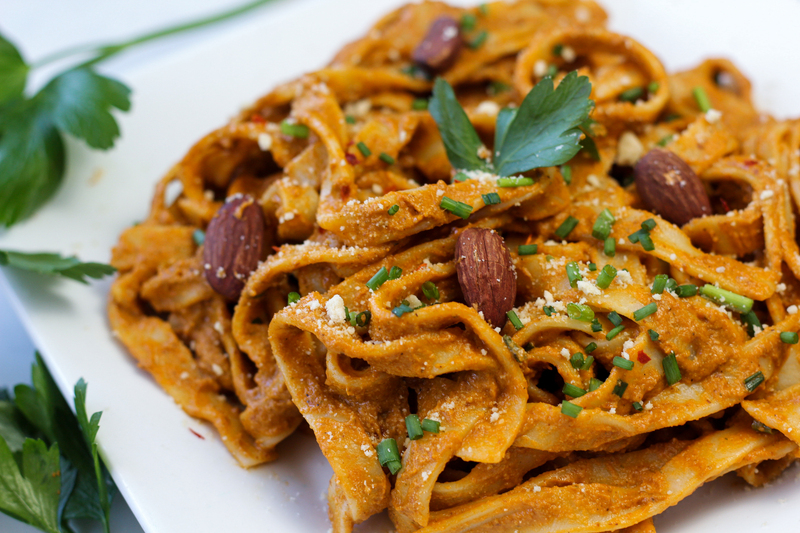 And if you are not pressed for time, try making this Vegan Roasted Red Pepper Alfredo with homemade pasta. YUM. 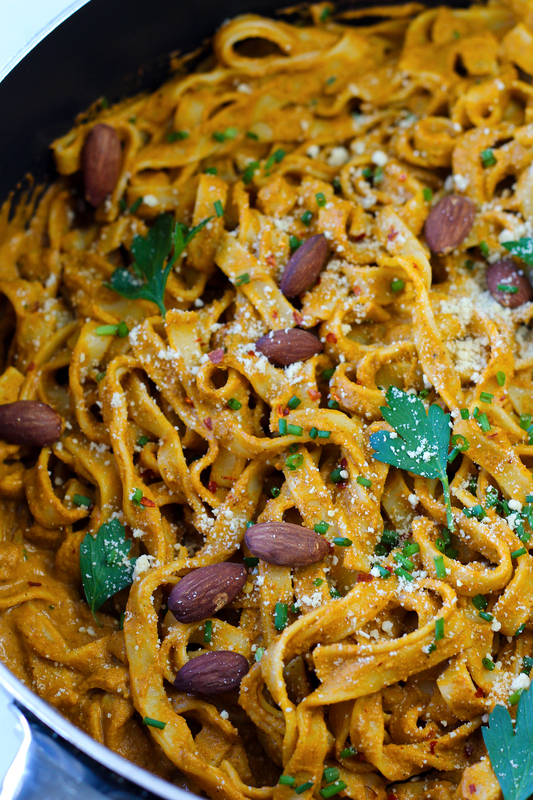 This Vegan Roasted Red Pepper Alfredo is ready in basically three simple steps. Throw all your ingredients in the blender. BLEND. Warm the sauce until thick. 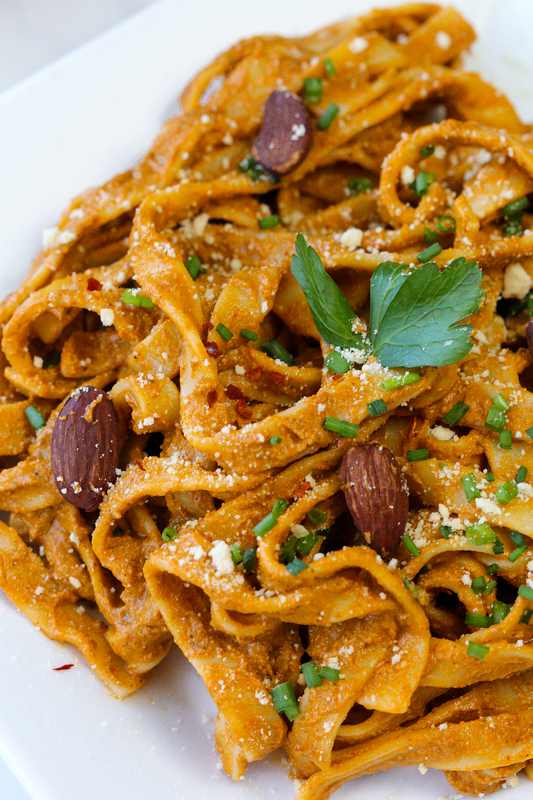 Toss the the fettuccine pasta with luscious and rich Roasted Red Pepper Alfredo. sauce. Devour. 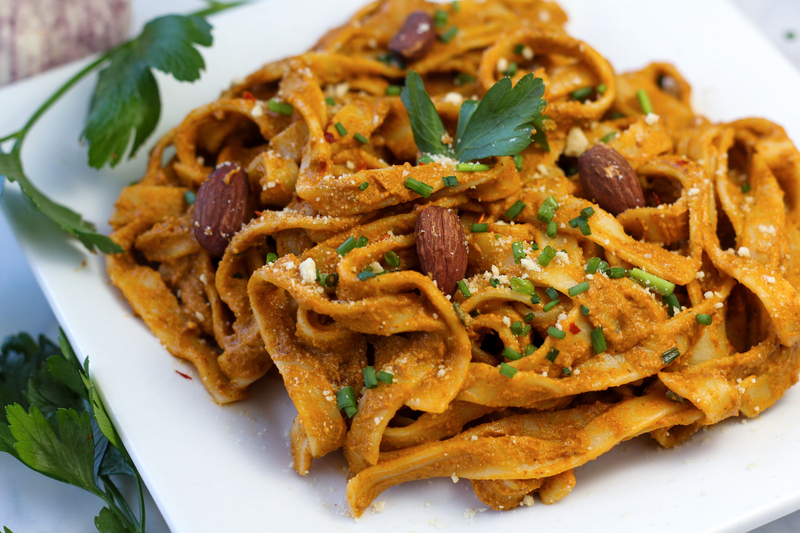 Vegan Roasted Red Pepper Alfredo is one of those meals where you will want seconds. The sauce is just SO rich and creamy with so much flavour. One thing I absolutely love about dairy-free cream sauces is that there is no post-dinner tummy ache that I used to get from dairy-rich, cream-based meals. If you make this Vegan Roasted Red Pepper Alfredo, leave your feedback in the comments below, snap a photo and tag me #CearasKitchen on Instagram. I love hearing from you! Don’t forget to top your Roasted Red Pepper Alfredo off with lots of Vegan Parmesan. Enjoy! 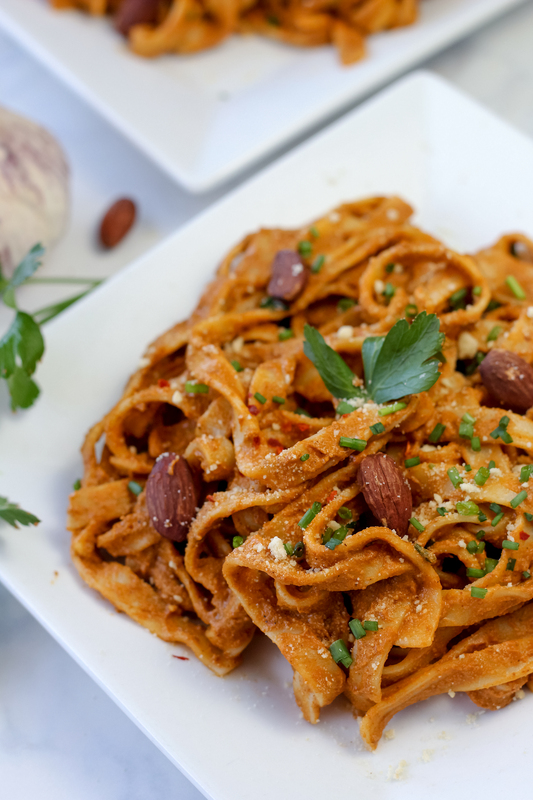 Luscious, creamy, and rich Vegan Roasted Red Pepper Alfredo made with roasted almonds, fresh basil, and roasted red peppers. Garnish with [url href=”https://www.cearaskitchen.com/vegan-parmesan/” target=”_blank”]vegan parmesan[/url], hot pepper flakes, and chives! Cook Fettuccine pasta with a pinch of salt in a big pot of boiling water until al dente. Add 1 cup water, roasted almonds, roasted red peppers, 2 cloves garlic, basil, 3 tbsp lemon juice, hot pepper flakes, and (optional) nutritional yeast to a blender. Blend until creamy smooth. Taste test and add the extra cloves garlic, tablespoon of lemon juice if it suits your taste. Add salt and pepper to taste. Over medium high heat, warm the Alfredo sauce in the large pot where you cooked the pasta until the sauce is thickened and warm. Add additional water if the sauce gets too thick. Toss the Fettuccine pasta with the roasted red pepper Alfredo. Garnish with hot pepper flakes, chives, [url href=”https://www.cearaskitchen.com/vegan-parmesan/” target=”_blank”]vegan parmesan[/url], roasted almonds, and fresh parsley. Enjoy! 1) If your red peppers are not preroasted. [b]Roast your red peppers[/b] by preheating the oven to 450F. [br]Cut the peppers in half. Remove the stem, seeds, and membranes. Roast the peppers until the skin blisters and turns black (15 to 20 minutes). Remove from oven and place the red peppers in a bowl. Cover with plastic, or a tea towel. The skins will peel off of the peppers easily when cooled. 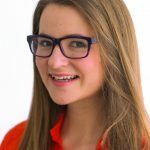 [br]2) If your almonds are not pre-roasted, roast your almonds at 400F for 6-9 minutes. [br]3) The nutritional yeast is optional – it gives this Alfredo a delicious cheesy and savoury flavour. [br]4) Use jarred roasted red peppers in water and not oil for this recipe to be oil-free. Just made this for lunch. Delicious!!! I just made this sauce and it is not rich nor is it creamy and the flavour is a bit too strong basil-wise, and I only used 1/2 cup. What did I do wrong??? I so wanted to like this! Hello! If I use fresh peppers for the sauce, how many would I use? 2 perhaps? Thank you! 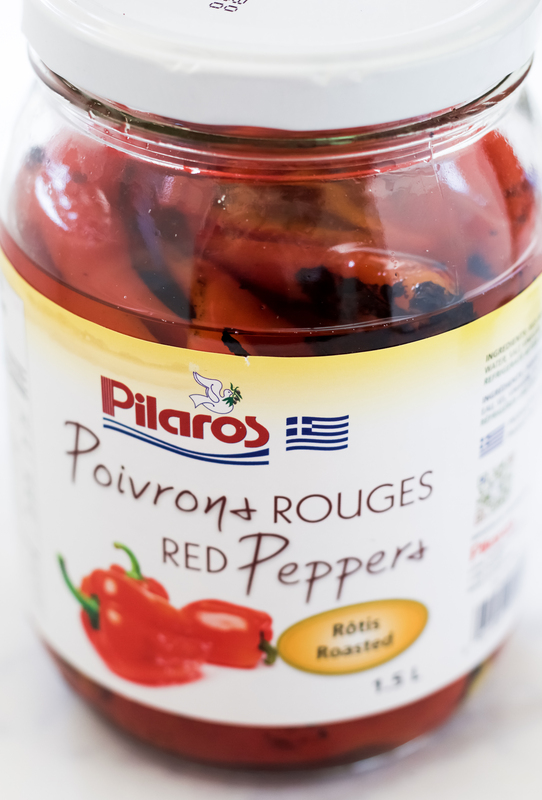 roasted red peppers are one of my favorite flavors – right now I am adding them to everything! definitely need to try this one! You made my mouth water! This sounds so good! Just looking at the ingredients, I can tell how wonderful this must taste! I love the simplicity of it, and the use of roasted red bell peppers too – yum! I love roasted red peppers! They pair so well with pasta and make a great sauce! That sauce looks amazing! This looks like the perfect meal to me. I love how rich and creamy this sauce looks! And that color from the peppers is just gorgeous!